Here's a selection of pieces we have made in our workshop. 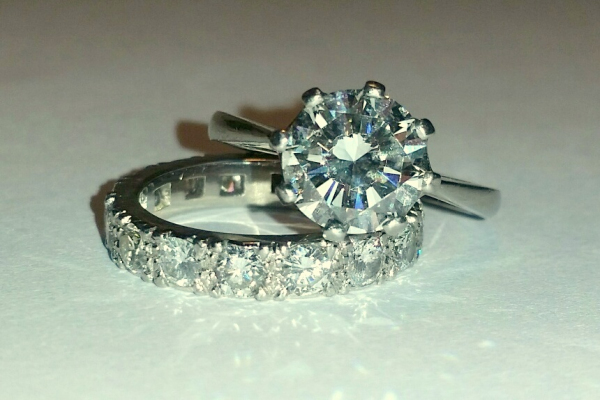 One of our amazing goldsmiths made a new platinum mount for the customers brilliant cut diamond solitaire ring and made 2 fitted bands in platinum to fit around it and set five .18ct diamonds in each band to create this stunning stack of fitted rings. The customer brought in this gorgeous ruby cluster ring and 1 diamond band that needed remaking, so we recrafted the 18ct yellow gold ruby ring completely by hand using the original gold and remade 1 band using customer's stones and 1 completely new one. Another stunning handmade ring from our on-site workshop. This ring was a copy of our customer's worn out one. It is made of platinum with a central blue sapphire, diamonds around and a tapered baguette diamond on each shoulder. 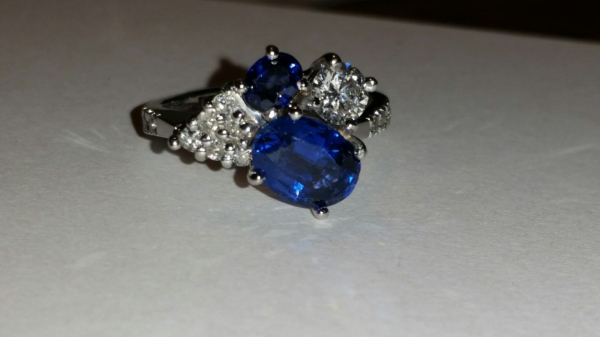 This sapphire and diamond ring was made using a selection of customer's stones from old pieces of jewellery. The design was chosen from several drawn up in our workshop. This is one of our more unusual pieces. 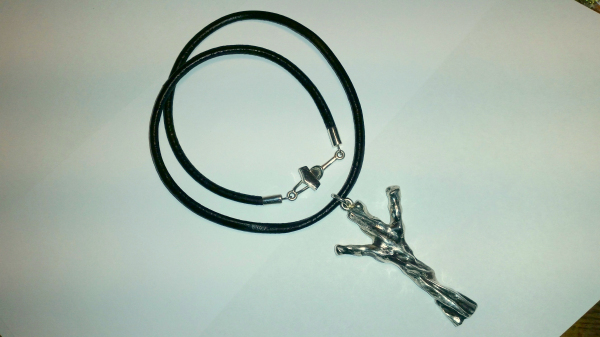 The customer brought in a piece of wood that he wanted copied in silver, using his own metal, and made into a pendant. We were able to replicate the shape, supply the leather cord and make a bespoke catch. 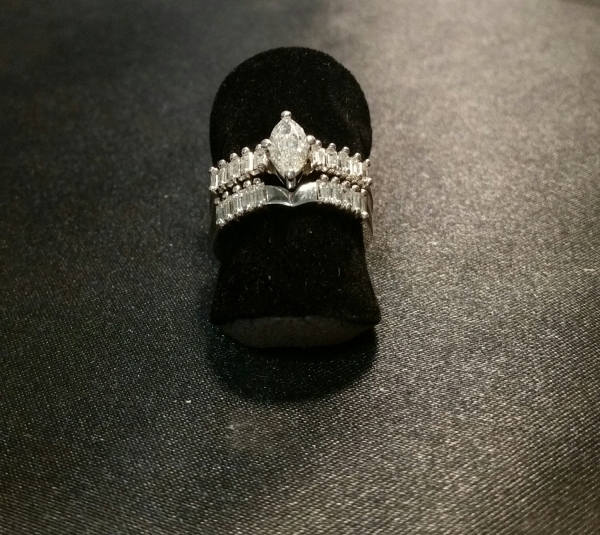 Our client came in seeking advice on her 2 diamond rings that were in need of some attention. After discussions she decided to have them both remade. 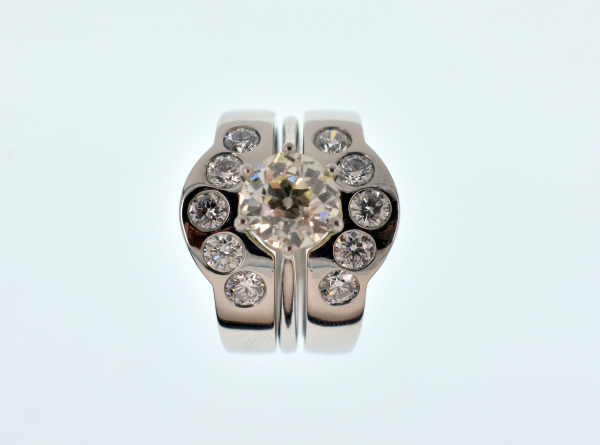 Our very talented, David, handmade the mounts in platinum and set the diamonds in our on-site workshop. We handmade this 18ct white gold baguette diamond wedding band to fit the customers existing engagement ring. 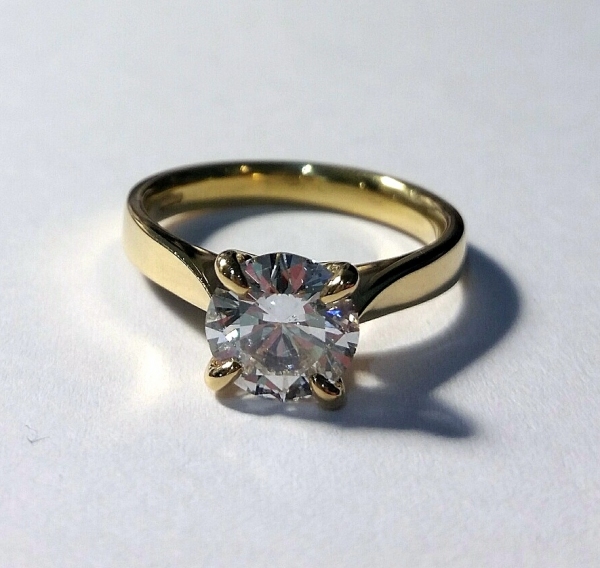 A lovely lady came into our workshop with a very sentimental diamond which she wanted mounted into a ring. The result was this beautiful ring.